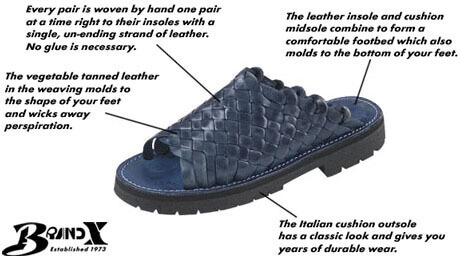 The Huarachero temporily attaches leather parts and insole to lasts with lasting tacks. Then the parts are woven together with a single unending strand of leather.No glue is necessary. The wet weaving is hammered flush on the last. Then the huaraches dry on their lasts. 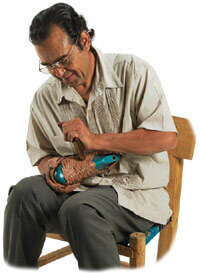 Finally, the Huarachero hand burnishes each pair with a hardwood wedge called a CUNA. Your new huaraches are now ready to have their Italian Micro-Tech outsoles attached.